You are currently browsing the tag archive for the ‘gene modifier’ tag. 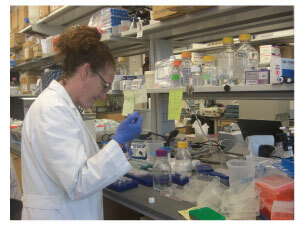 Last week the trustees of RSRT voted to award continued funding to Monica Justice of Baylor College of Medicine. Dr. Justice is a mouse geneticist (yes…there really is such a thing) who is spearheading one of the most unique projects in the Rett research arena today. For background information please read the September 2009 blog interview with Dr. Justice. This project is a mammoth undertaking – the kind that requires a certain sense of fearlessness on the part of the investigator (and the funding agency). The risks are high but are in line with the potential rewards. I feel a certain sense of attachment to this particular project as I was present when the idea was first suggested. At the time I was the Director of Research at the Rett Syndrome Research Foundation (RSRF) and I organized the annual Rett Syndrome Symposiums that spanned three days at the end of every June. At the 2006 meeting I cajoled two dozen of the brightest and most creative scientists to join me for an early morning, pre-meeting gathering I called the “knowledge gap meeting”. I posed the following challenge: develop a prioritized list of high-impact experiments that no one was currently undertaking and that was unlikely to be funded by traditional agencies. After a two-hour discussion the group delivered their top contender: a modifier screen to identify genes that suppress the effects of an MECP2 mutation. My next task was to find the best possible person to undertake the screen and talk them into taking it on. I organized a Rett workshop a few months later at a “Mouse Genetics Meeting” (yes…they have those) in Charleston, SC, which attracted a number of candidates. Bottom line – I courted Dr. Justice and she enthusiastically agreed to pursue the project. Fast-forward almost five years and I’m delighted that the project is thriving and yielding a wealth of information. I recently caught up with Dr. Justice to discuss how the project is faring. MC: Dr. Justice, thank you for taking time away from your work to bring our readers up to date on your fascinating project. Please tell us how things are going. MJ: My pleasure, Monica. I want to start by saying that this project would never have been funded by the NIH [editor’s note: National Institutes of Health] nor would I have proposed this to your foundation, had you not approached me about it. I knew little about Rett Syndrome when I started this project. MC: Tell us a bit about modifiers. Do you think they exist for every disease? MJ: I think that most diseases can be influenced by mutations but I don’t think every disease necessarily has modifiers. MC: Do you have a sense of how many screens like yours are ongoing right now? MJ: I know of only a few in the mouse. MC: Do you know of any screens that have yielded modifiers that suggest a drug for the particular disease? MJ: That’s a great question, Monica. I do not. The goal of most of the modifier screens is not to identify drugs but rather to understand some developmental or biochemical pathway. I think with our screen we are learning a lot about the biology of the pathway, but our hope is to find a drug-targetable pathway. MC: Can you summarize the progress and the ups and downs of the project? MJ: At the inception of the project we encountered several problems. We really had no idea that the Mecp2 mutant females would be such poor breeders. We tried all sorts of tricks to improve their breeding capacity, because we needed a lot of them to do the screen, and nothing worked. We kept at it, though, just with basic mouse breeding, and eventually got up to speed. Also, in the beginning we had some communication issues within the lab. I’m not sure we were expecting quite as many modifiers as we found. But we then developed a system, and that system worked very well; then things started moving along beautifully. I also realized early on that I needed to participate in a very hands-on way with this project. As we isolated each modifier line, we realized that each one was different: that is, none suppressed the disease entirely, but each modifier line appeared to suppress a subset of Rett symptoms. Even so, each line allowed the mice to live longer, function better and be healthier. However some of them developed other symptoms, such as inflammation and susceptibility to infection, which could also shorten their lifespan. So, we worked with our veterinarians who helped us decide how to treat these mice. For example, we found that putting them on antibiotics worked extremely well. And so, there were some unforeseen glitches in the beginning that are moving very smoothly now. We have isolated five modifier lines. We have put the screen on hold for now and are concentrating on understanding these five modifier lines. We have identified three suppressor genes so far and have candidates for the other two. We feel that the screen and the gene identification have gone extremely well. Each of the modifiers has a different phenotype in that they rescue different symptoms, and we find that each modifier locus is affecting a different gene. For example, in one line that we named “Romeo,” the suppressor delays the onset of Rett-like symptoms, and the mice have no inflammatory lesions, but eventually, the mice succumb with symptoms. Therefore, the onset of neurological symptoms is later in their life, making their lifespan longer. Another line, “Henry” develops almost no Rett-like symptoms, and lives nearly a full long life, with only a few mild inflammatory skin lesions late in life. Another line, “Cletus”, rescues some of the neurological symptoms so the mice live longer, but the long-lived mice have severe inflammatory lesions, even early in life. Remember that each of these lines carries the Mecp2 (Bird) null allele, along with a second site mutation that alleviates its symptoms. MC: It’s possible to figure out statistically how many mice you have to go through so that you’ve saturated the genome – in other words, ensure that you have a mutation in every gene. What percentage of the genome has your screen hit so far? MJ: I think we are between ten and twenty percent of the way through. MC: So there is a way to go. MJ: Based on our work thus far we could find another 25 modifiers. MC: The ideal situation is that the suppressors you find are in pathways that are somewhat known and, ideally, for which there are already drugs associated. But you also have to figure out just how the suppressor inhibits the ill effects of having an MeCP2 mutation. MJ: Yes, there are many steps that we have to take after we find a modifier gene, to understand what’s going on. MC: One of the surprising things that have already come out of your screen is the mere fact that MeCP2 has so many modifiers. Why do you think that is the case? MJ: My hypothesis is that the biological system in Rett is sort of poised on the edge, and it’s not so detrimental that it, for instance, causes death immediately. It’s very easy to tip the scale toward a little bit better—– or a little bit worse. And my feeling after doing the screens is that MeCP2 creates that kind of situation in the cells, that they’re poised to go one direction or another pretty easily. MC: Your hypothesis suggests that there could be lots of things that improve Rett symptoms. MJ: Absolutely. And maybe combining them will provide an amazing improvement. MC: What is your time frame for restarting the screen? MJ: I’m usually an optimist about time; my hope would be that, within a year, we could start the screen again. MC: One of my favorite things about the screen is that it is completely unbiased. Preconceptions and favored hypothesis don’t play a role here. The animal tells you what is important and you simply go where the data leads you. I find that very reassuring. MJ: I completely agree. Often, we have been totally surprised, then after generating more data, the mode of suppression makes complete sense. We are learning a lot from these animals. MC: I will leave our readers with one last comment. Over the past 12 years I’ve overseen peer-review for well over a thousand research applications for funding. So I’ve read my fair share of reviewer comments. Typically reviewers are a conservative bunch; even if they are enthusiastic about a project they tend to be cautious. Your recent proposal, however, generated comments like “Wow”. That’s truly unusual and a real tribute to your creativity, risk-taking and perseverance. I am thrilled that RSRT can partner with you and hope that together we can deliver some much-needed treatments to kids and adults who are in such desperate need.